Since starting my research about early BC booksellers, I’ve been curious about why they were so often called stationers. True, most bookstores of the nineteenth and early twentieth centuries sold stationery products in addition to books (as they do today). But it turns out that their proprietors’ common title of “stationer” had a lot more to do with the historical origins of bookselling than with their inventory. 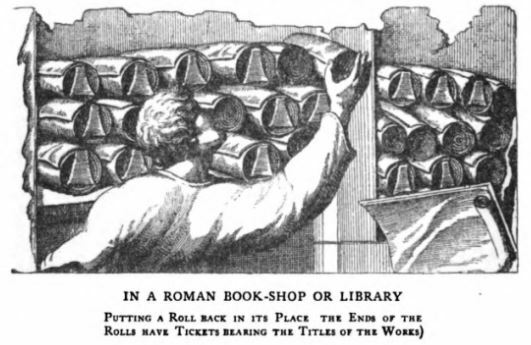 Illustration from Frank A. Mumby, The Romance of Bookselling, p. 12. It is easy to romanticize these stationarii at their stalls, disseminating learning and ideas to a literate Roman public. However, the Middle Ages book trade evolved from a less-than-wonderful method of making books that were both plentiful and cheap. By the time of the stationarii in about the thirteenth century, monks and university-trained copyists had largely replaced slaves as the main source of transcription labour. And two centuries later, the printing press would, when it came to book reproduction, displace the human hand for good. (1) Henry Curwen, A History of Booksellers, the Old and the New (London: Chatto and Windus, 1873), 13-14. (2) This and the next two quotes are from Curwen, 10-11.